Rare books by Samuel Beckett, including first editions and signed first edition copies of Ulysses, Finnegan’s Wakem and Murphy. Samuel Beckett (1906-1989) was an Irish avant-garde novelist, playwright, theatre director, and poet, who resided for most of his life in Paris. He produced work across both languages throughout his career. After completing studies in French, Italian and English at Trinity College, Dublin, Beckett took a teaching post at the École Normale Supérieure in Paris. It was in Paris he met James Joyce, and maintained a working literary relationship with the author, including undertaking research forFinnegan’s Wake. Waiting for Godot. A Tragicomedy in Two Acts. Pas suivi de quatre esquisses. His first major work, Proust, was published in London in 1931. The death of his father caused him to spend two years in treatment at the Tavistock Clinic. His experiences of this time are apparent throughout the early middle period of this work. 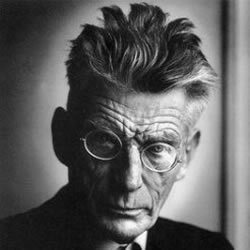 Beckett wrote his first novel in 1932, but no publishing house would take it. Instead, he wrote many more essays and poems, as well as a collection of short stories More Pricks than Kicks, using the unpublished novel as a source for a wider body of work. 1935 saw his first poetry collection Echo’s Bones and Other Precipitateapublished, while he continued to work on full length novelMurphy, published 1938. Beckett spent World War II working for the Resistance in Roussillon, though simultaneously worked on his novel Watt, to be published in 1945. It was in the immediate post-war period that Beckett produced his most famous works and developed the play that would become a flag ship the post-modernist movement: Waiting for Godot.